What does a kangaroo have to do with aeroplanes? Enough to inspire Singapore Polytechnic student Bryan Lim into making a "bendable" landing system to help aircraft land more smoothly. "Kangaroos' muscles compress as they jump, reducing the landing impact," said the 17-year-old, after being taught during his engineering systems classes how to apply animal movement in product design. He is one of 40 pioneer students taking the new diploma programme, which merges social science and management with engineering. This is just one of the latest "hybrid" courses introduced by Singapore's polytechnics to change the face of engineering, long seen as "boring". These multi-disciplinary programmes, which marry engineering with business studies or the life sciences, are also altering the make-up of engineering students. While engineering courses used to draw those with poorer O-level scores of 18 points and more, students with aggregate scores as low as nine points are flocking to these new courses. Said Bryan, who scored 11 points for five subjects in his O levels: "I chose the course because of its multi-disciplinary nature and we also get to learn how we affect society with products." Dr Thian Boon Meng, who oversees the new Singapore Poly (SP) course, said: "Students prefer to study engineering alongside other areas. That's why more hybrid courses are sprouting." At Ngee Ann Poly, for instance, its Engineering with Business Management programme has about 200 students now, up from 160 in 2010 when it was launched. "Students enjoy the flexibility. They can use the financial management and marketing skills in engineering companies," said the school's deputy principal Mah Wee Beng. Nanyang Polytechnic will start a similar diploma next year. The introduction of hybrid courses is just one of the measures polys here are taking to stop a brain drain which has seen top students eschew engineering for more lucrative or interesting diplomas in business, media studies and the life sciences. While engineering courses linked to the growing aviation industry, like aeronautical engineering and aerospace electronics, continue to attract high-calibre students, "traditional" courses like electrical and electronic engineering remain less popular. Cut-off points for these diplomas range from 22 to 26, said Mr Mah, who heads a committee set up by the polys in 2004 to revive students' interest in engineering. Polys are paying greater attention to this problem, he added, explaining that this is a global issue, with fewer students opting for science, technology, engineering and mathematics degrees. "Interest is key, and students find it difficult to relate to such 'hard-core' topics as they require a lot of mathematics," said Mr Mah. That is why all polys, starting with Ngee Ann in 2005, allow students to take modules from various engineering disciplines for a year before deciding on a speciality. 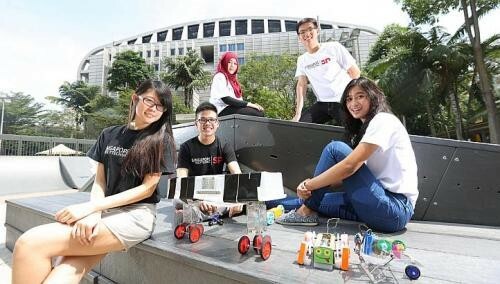 Poly representatives in Mr Mah's committee also organise campus workshops and industry visits for secondary school students and teachers to better understand the engineering profession. Raising awareness of the field is a continuing challenge, admitted Mr Mah. He added that for students to get excited about engineering, "they must believe they can make an impact with their work".